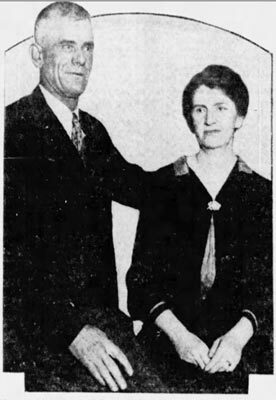 It was a strange honeymoon for Mr. and Mrs. Edward Beane of 44 Michigan Street when on April 14, 1912 they fled the doomed Titanic and from the temporary safety of a rowboat saw the gallant ship and its human cargo go crashing down to Davy Jones' locker. Looking back on the event after 19 years with two eager young sons to prod reluctant memory, the event is a hideous nightmare, they say. Mrs. Beane, a bride of 17, longed in that midnight hour of disaster for the secure shelter of her home in Norwich, England. "For years I didn't want to talk about it." she said yesterday as her sons bent their heads over yellowed newspapers which described the event. "Wherever we went, people pointed at us curiously, and made us aware that death had brushed us by. We must have been a mile away in the rowboat when the Titanic went down. We could hear the band playing and then just before the crash of sinking the anguished cries of those on board which was like one great human wail. It was years before I could forget that terrible scream." Mr. Beane had been in the United States some years and had made several crossings before he sailed with his bride on the maiden voyage of the great Titanic, new mistress of the seas. They loved the beauty of the new ship and waved goodbye to their friends with happy pride. And yet they confessed to a fear of forboding when the Titanic narrowly avoided a collision in the Southampton harbor. The night of the 13th was stormy and dark, but the 14th dawned clear and bright. The boat was ripping through the water at 21 knots an hour, under orders to make a new record, when near midnight she struck an iceberg. It was some time before all the passengers realized the situations. The Beanes were, at first, not alarmed and received the news that the boat was sinking calmly, suspecting the commotion was only a boat drill. Indeed they were so laconic that a woman in the next stateroom came back twice to warn them. And then they were caught up in the terror of the event and went rushing up the stairs to the deck, the jewels on the night stand forgotten and the beautiful linens and embroideries in the bride's trousseau, just neglected trappings. "The crew had their rifles to keep the men back until the women and children could get into the boats," explained Mr. Beane. "A man never knows what he'll do in an emergency or what tricks his nerves will play on him. I saw a man shot down for trying to break through the ----illegible---. I saw Charles Williams, the prize fighter coming over for a tag match drop back when the rifle fire scorched his fingers for overeagerness. He was a big brute of a man, too." Mrs. Beane was hustled into one of the lifeboats, dazed and stricken, and a little hypnotized by the terrifying beauty of that torchlit deck and its cowering humans; and strengthened too by the sturdy valor of a crew which went down with their ship. Mr. Beane, like the other men on the boat, could find no place in the lifeboats, and so jumped overboard. After swimming about in the water for hours he was picked up by one of the small rowboats and eventually put on board the Carpathia with the other survivors. It was 12 o'clock when they left the Titanic and it was 8 o'clock next morning when the Carpathia was sighted. "And all any of us wanted was solid ground under our feet and forgetfulness," they added. Neither Mr. nor Mrs. Beane have been on an ocean going ship since they disembarked from the Carpathia.